The “401” is a highway that runs along the north shore of Lake Ontario from Windsor to the Quebec/Ontario border. As it stretches through the city of Toronto it is eighteen lanes, but gradually narrows to four lanes the further it gets from the city. Along the way, the highway runs close enough to the lake to get glimpses of the water where ever trees or buildings don’t block the view. So it was along the 401 East that I found myself trying to keep my eyes on the road as I spotted an unusually shaped cloud. The cloud hovered over the lake like an oval space ship. 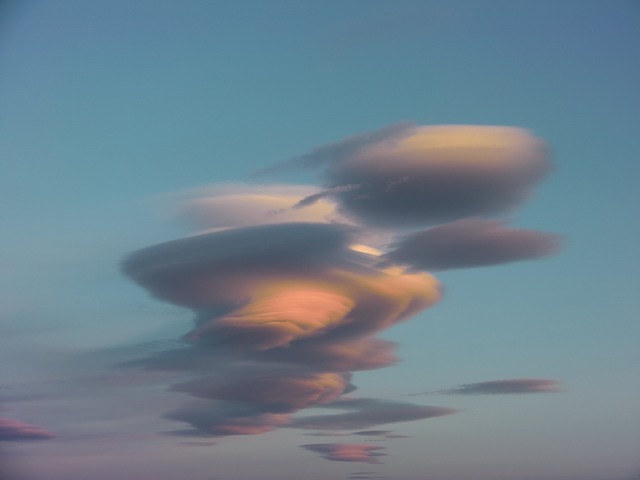 Was this a lenticular cloud? I really want to see one of those. But, they only form in mountainous areas. As much as I dared, I watched the cloud wondering why it was that shape. I was excited to think I was seeing something unusual. Finally, as I progressed around the edge of the lake, the unusual cloud revealed itself to be the very end of a very ordinary bank of clouds. The cloud bank trailed off into the southwest and the mystery of the cloud dissipated. Only perspective made the cloud I saw any different from any other normal cloud. Had I not had to drive on, I would only have seen something wondrous. But changing my physical position relative to the cloud revealed it was somewhat less so. That’s how it is with most things. Change your perspective, and the thing you are looking at changes too. If you are pained by any external thing, it is not this thing that disturbs you, but your own judgment about it. And it is in your power to wipe out this judgment now. Sometimes it’s a bit disappointing to discover that the view you held initially isn’t the whole story.